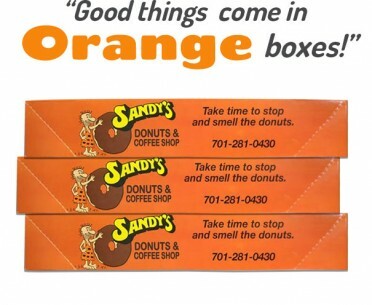 Did you know that for a small fee we will deliver Donuts right to your home or office. 1 dozen is our minimum order. We deliver from 7AM until 1PM Monday thru Sunday. Use our online store to select and order an assortment or you can place an order by giving us a call at 701 281-0430. We deliver within a 10 mile radius of our West Fargo store, which now includes, Harwood, Horace, Dilworth, and Mapleton. For Special Events and Large Orders outside the 10 mile radius please give us a call. We charge 55 cents per mile with a minimum of a $100 order. Do you want to send a special THANK YOU to someone or just put a smile on someone’s face? Have donuts delivered right to them! We deliver to businesses anywhere in the Fargo-Moorhead-West Fargo area! And now delivering to Harwood, Horace, Dilworth and Mapleton!